"We're protecting the truth, we're protecting lives." But are they really? That's the real question. This isn't a new trailer, but we're featuring it because the documentary is opening in theaters this week. Killing Them Safely is a documentary about how Tasers are arming some law enforcement agencies with a weapon that is being purported as nonlethal even though it can be deadly. The trailer doesn't show much footage, just some statistics, quotes, and a bit of an interview with one of the guys from Taser. The rest you'll have to see in the doc itself. I will say I'm interested in checking this out. I also have to point out the awesome poster for this doc, also seen below the trailer - impressive design work. If you're at all intrigued, give this doc a watch. Hundreds of deaths. Zero oversight. In the early 2000s, brothers Tom and Rick Smith revolutionized policing by marketing the Taser to law enforcement agencies. This supposedly safe alternative to handguns was supposed to curb the use of deadly force—so why have over 500 people died from Taser-related injuries since? At a time when questions about police methods are at the forefront of the national dialogue, Killing Them Safely brings together startling archival footage and eye-opening interviews with experts on both sides of the debate to shed much-needed light on an urgent issue. 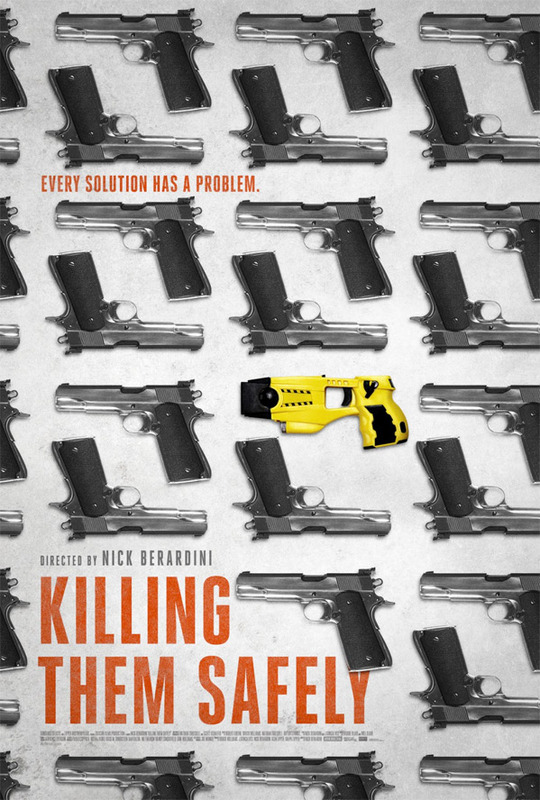 Killing Them Safely is directed by newcomer Nick Berardini, and premiered at the Tribeca Film Festival. IFC/Sundance Selects will release the documentary in sleect theaters + VOD starting November 27th. For more info, visit here. This may turn out to be an interesting movie. But I don't understand something; why are they against tasers? Do they think we should just use guns all the time? Yeah, those are much safer to shoot a perpetrator with. Based on the title, I'd imagine they will be arguing that tasers kill enough people to not be "safer" as you call them. As we have seen time and time again, giant corporations are always honest, and will always put human safety above profits... right? I agree. But let's look at the fatality rate for being shot with a gun as it compares to being hit with a Taser. Taser's probably aren't perfect but it's better than the alternative; being shot with a gun or having our police at a disadvantage with some wacko. BTW, I don't own stock in Taser. I just think it's an odd thing for a film maker to go after. But once I see it, I may have a different take. You're missing the point: If you're a cop and you and others are being threatened by a guy with a knife, you have two choices to keep others and yourself from harm; pull your gun and shoot him or taser him. If he's tased he'll probably wake up with a headache. If he's shot he probably won't wake up. Idealist, yes. The scenario I discribed was real. I saw a drunk guy stab two other people outside a pub. The cops would have been in the right to shoot the guy dead. And they had guns pointed at him but he would not drop the knife. Instead they tased him. I'm a realist but wish to be an idealist someday. Or they could shoot him in the freaking hand and legs. Guy cant hurt you when he can't walk or use his arms. you are so clueless and stupid it's actually entertaining. You'd be dead trying the stupid things you think other people should risk their lives trying to do. A simple test. Be shot in the stomach with a gun or a taser. Tasers may not be perfect, but I know what my choice would be. They are objectively safer though. You COULD die if shot in the chest with a taser, you WILL die if shot with a gun. Why are people being shot in the chest at ALL? Maybe we should train cops to shoot people in the legs. I mean why the )@(*# are cops always shooting people in the chest and head anyway? It's one thing if the person is shooting you back but clearly from the hundreds of videos where people are being murdered by cops they aren't and the cops just kill them anyway and ask questions later. Because if a cop is discharging their firearm they are doing it to kill you, real life is not the movies. They do not shoot to disarm, wound, warn, they shoot to kill. Thats all I will say though your line of "where people are being murdered by cops" tells you me you have a very misinformed view of the police force. Not saying there are not some actual murders by cops, but they are so very rare. Certainly not hundreds. That's not a good enough excuse. Their job is actually to 'Serve and Protect' not kill. More Americans have been killed by cops in the last decade than soldiers died in Iraq. This is a huge problem that isn't going away, no matter how people want to defend it. At the end of the day, "Less than Lethal" weapons are BS. Train the men who wield them to be better. Our true genius as a species is our constant evolution in ways to murder each other. My country just magically found £178 billion for defence for the next few years when last month they were telling everyone they had no money. Always plenty money for weapons. I hope the guy in the trailer has some inner turmoil, he seems to, behind his empty eyes. the film kinda misses the real reason most people die when tasers are used. It's called excited delirium. basically cops end up tasing people that are so doped up to the gills that they have one foot in the grave already before the cops even show up. But hey, what does actual science matter when you want to push your agenda? What agenda is that, the one that say every single person cops taser is 'doped up to the gills?' Give me a @*(&# break. Have you seen the recent video where the woman cop tasers the white guy in the snow and he can barely move and then she went ahead and shot and killed him anyway? Cops killing innocent people is a major problem that isn't going away.